...But I do know that I like these glass sculptures of diseases. The one above is a close-up of a single E. coli (is that how you say that?). 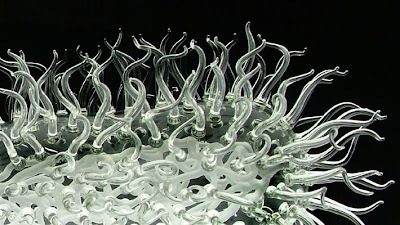 Luke Jerram created a number of them depicting viruses and bacteria. The microscopic world is truly a weird-looking place. "It's great to be exploring the edges of scientific understanding and visualisation of a virus. Scientists aren't able to answer many of the questions I ask them, such as how the RNA is exactly fitted within the Capsid? At the moment, the technology isn't there to answer all these questions for certain. I'm also pushing the boundaries of glassblowing. Some of my designs simply can't be created in glass, Some are simply too fragile and gravity would cause them to collapse under their own weight. So there's a very careful balancing act that needs to take place, between the limitations of current scientific knowledge and glassblowing techniques." That last sentence isn't a phrase you hear too much.